Side Burn makes the most of his advanced speed and acceleration by chasing enemies until their circuits on the highway. He loves to go rocketing down long, straight roads just to see how fast he can go. But he doesn't take unnecessary risks because he knows his speed is important in the fight against Megatron. Robot Mode: If there is one thing that can be said about the Robots in Disguise / Car Robots Transformers, it's that none of them follow any previously established standard pattern when it comes to their transformations. Take Sideburn for example. Now with most car Transformers, the robot would either end up with the hood or the roof of the car as a chest. Not so Sideburn. The actual robot really has very little in the way of car parts making up his body. The car roof is a shield on his arm, the hood is hanging off his back, the front bumper is on his shoulder, the rear bumper is his weapon, and so on and so forth. You can probably get away with calling him a shell-former. All of which means that the actual Sideburn robot is a very posable and lean fellow with lots of good detailing on him. It also means, though, that Sideburn's theoretically excellent posability is somewhat restricted by the kibble hanging off his body in odd places. Especially the bumber on his right shoulder always seems to get in the way. Sideburn carries the rear bumper of his car as a missile launcher, as well as a small silver gun/dagger thing. He can also use the car roof as a shield. So all in all Sideburn is a pretty good robot with a highly innovative design, but with lots of kibble that gets in the way. Alternate Mode: Sideburn's alterante mode is a blue sportscar, a Dodge Viper to be precise. The car is very nicely done and the only bad thing I can say about is that you can see some of the robot parts through the transparent windshields. Apart from that, though, a great car mode. All of Sideburn's weapons store away here, too, leaving no small parts to be easily lost. All that, plus I'm a big fan of the Dodge Viper. So all in all, one of the best vehicle modes of that era. 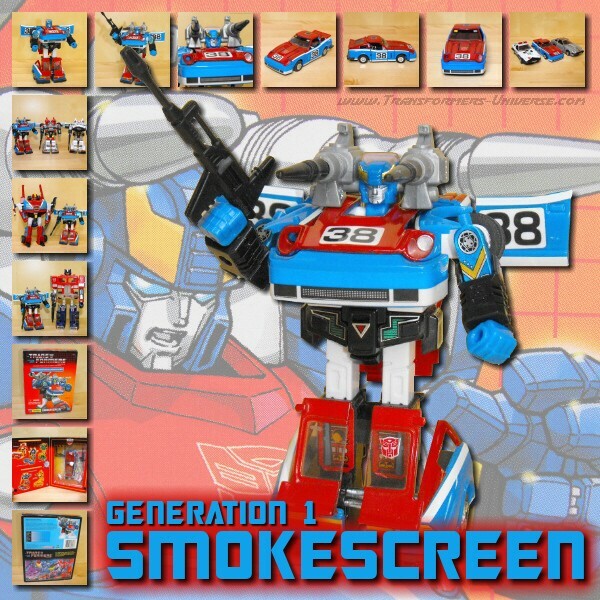 Remarks: In the Robots in Disguise cartoon Sideburn was yet another incarnation of the "young speedster" stereotype among the good guys, following in the footsteps of guys like Hot Rod and Cheetor, paving the way for Armada Hot Shot and Animated Bumblebee. Most of the times he was more concerned with chasing after little red sportscars (often to the detriment of his current mission) than anything else. Later a surge of Matrix energy from Ultra Magnus gave him a Super Mode, making him a red sportscar as well. How exactly that went with his obsession is best left to the imagination. As a figure Sideburn combines a pretty cool look, great posability, and an innovative design into a pretty nice package. Sadly his robot mode is hampered by lots of kibble, which drags him down quite a bit, but at the end of the days he still remains a pretty good Autobot figure with a great car mode. Recommended to all Car-Transformer fans.